Make your garage more than a garage. If your home is like most, your garage is probably piled high with holiday decorations, lawn tools, recreational equipment and other storage, but what if there was a better use for that space? Think about all of that untapped potential just sitting in your garage. With that space, you could create the ultimate man-cave, home gym, pet area, play room, craft room, smoking lounge, auto maintenance shop or virtually anything else! The sky’s the limit when it comes to your garage, especially when you equip your garage with a LifeStyle garage screen door. What is a garage door screen? When you want to play a round of table tennis or lift weights in your garage/home gym, opening the door is an absolute must. It just gets too hot in the garage, particularly during our muggy, Pensacola summers. But if you open your garage door, you may just be eaten alive by mosquitoes and other insects. Or, you could be inviting all kinds of pests to settle into your garage. Both of these problems can be avoided with a LifeStyle garage door screen. These high-quality screens were designed so that you can enjoy the fresh air in your garage once again! 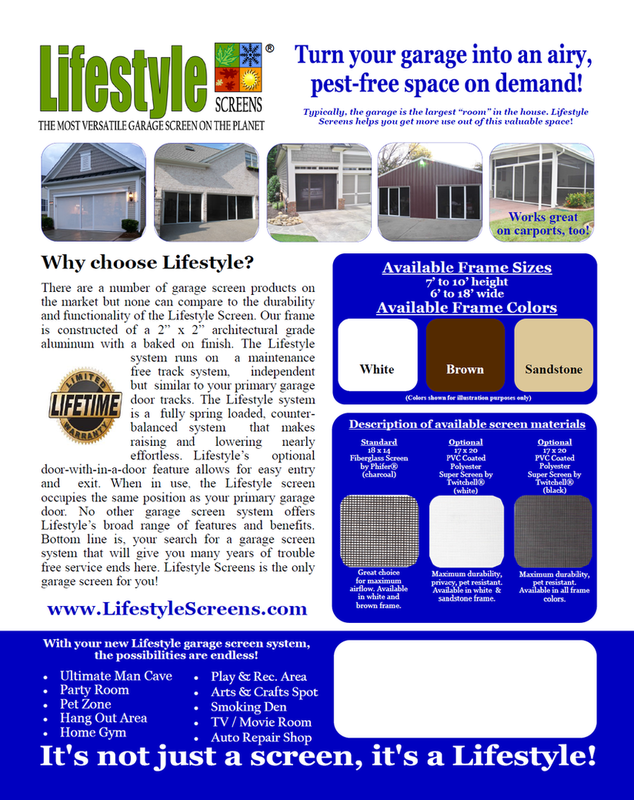 Why choose a LifeStyle screen? 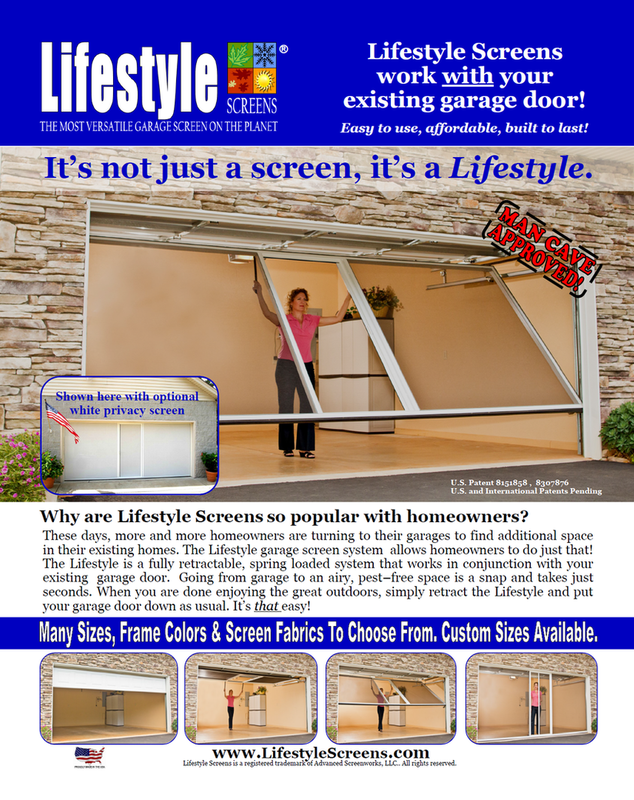 There are many different garage screens out there, but when you want the best, LifeStyle is your only option. The LifeStyle system is a counterbalanced system that is spring loaded, allowing for ease when raising these screens up or down. These screens come in a variety of colors and styles, but no matter what you choose, you can rest assured that the frame is made of architectural-grade aluminum and is designed to last. You also have the option to take advantage of the “door-within-a-door” feature, which allows for easy entry and exit. Take your garage to the next level with RTS All American Garage Doors. Your garage can be so much more than just a storage space, and the LifeStyle garage screen door can help. No matter what you plan to use the space for, keep it pest free and breezy with these high-quality garage screens. And when you work with RTS, we’ll even install it for you! We’ve been serving the good people of Pensacola for over 10 years now, and we’re dedicated to excellence in everything we do. Contact us today to get started, and be sure to ask about our military and senior discounts!